Every day, industrial workers in San Francisco and throughout California are exposed to a number of toxic and hazardous materials. Oftentimes, the cumulative exposure over many years of work cause workers to develop serious illnesses, and in some cases lead to death. Personal injury lawsuits designed to compensate injured workers—sometimes called “toxic torts”—can take many years to work their way through the courts. Recently the California Supreme Court reinstated a toxic tort case that has been pending for nearly six years. The plaintiff worked for nearly 37 years as a mold maker and machine operator for a metal foundry. As a result of exposure to toxic chemicals at the foundry, the plaintiff said that he developed interstitial pulmonary fibrosis, a serious respiratory disease that results in scar tissue forming on the lungs. The plaintiff sued a number of defendants, each of whom are alleged to be partly responsible for supplying materials used at the foundry. These materials, used as designed and intended by their manufacturers, allegedly produced fumes and dust inhaled by the plaintiff, which in led to his developing pulmonary fibrosis. The plaintiff accuses the plaintiffs of not only negligence, but also defective product design and failure to warn him of the dangers of exposure. After several years of pretrial proceedings, the trial judge dismissed the plaintiff’s lawsuit based on a similar case decided in 2014 by the California Second District Court of Appeals. In that case, the appeals court held that an injured worker could not hold the manufacturers liable under the “component parts doctrine.” This is a legal rule in California that provides a supplier of “a component or raw material” is not liable for any defects in a finished product using said materials, so long as the supplied components are not themselves defective. The trial judge in this case determined this same component parts doctrine absolved the defendants of any liability. The plaintiff appealed and a different appeals court, the Fourth District, disagreed with the law as stated in Second District’s earlier decision and said the plaintiff could proceed with his lawsuit. The defendants then asked the Supreme Court to intervene. 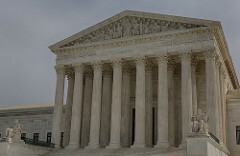 In a unanimous June 23 opinion, the Supreme Court agreed with the Fourth District that the component parts doctrine did not apply to the facts of this particular lawsuit. Chief Justice Tani Cantil-Sakauye, writing for the Court, said the component parts doctrine was meant to protect suppliers whose raw materials were somehow transformed or incorporated “into a different or finished end product.” In contrast, the plaintiff here claims his injury was caused due to materials that were “used in the manner intended by the product supplier.” The chief justice emphasized, however, that the Court was not expressing its views on the merits of the plaintiff’s lawsuit and that he would still need to prove the defendants either produced a defective product or failed to properly warn him about their risks. If you or a family member suffer from a serious disease due to workplace exposure to toxic materials, it is important to seek legal advice from a reputable source. An experienced San Francisco toxic torts attorney can advise you on many types of cases, including product liability and chemical exposure. Contact the Brod Law Firm today if you would like to speak with an attorney right away.